James H. Hilton (University Photographs, box 59). biographical information, addresses and speeches, Board of Regents’ materials, correspondence, minutes, and printed materials. The records document the programmatic relationship of Iowa State with the other Regents’ Universities, student activities such as military participation, and agricultural research and other projects undertaken by the various Colleges within the University. 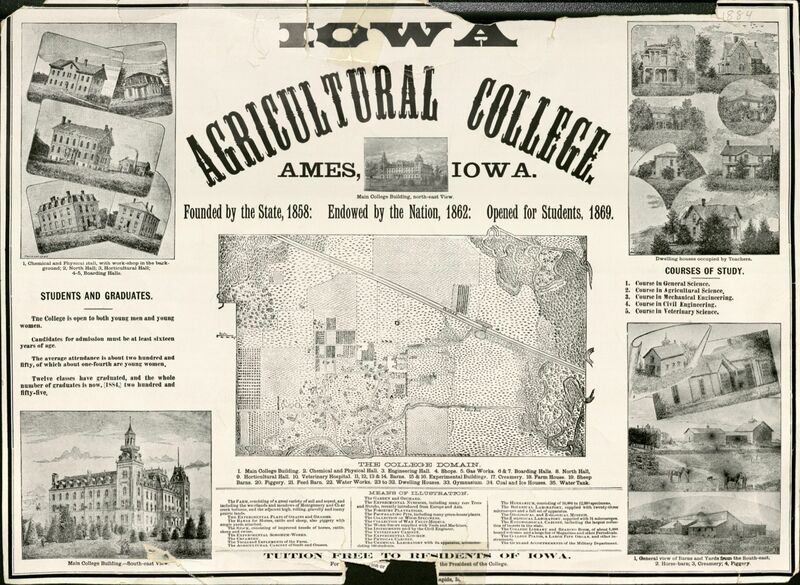 Also included is information regarding Iowa State’s participation in national academic organizations, such as the Association of Land-Grant Colleges (James H. Hilton Papers, RS 2/10). Below is a postcard written to James Hilton after the students rioted after Homecoming in 1953. (RS 2/10, box 19, folder 28). The documents below are in a folder titled “Civil Defense” and include information on surviving a nuclear attack. There are other materials in the Hilton Papers that document how the Cold War affected Iowa State University. If you are interested in conducting research, drop by and see us. We’re in room 403 Parks and open Monday-Friday from 9-5. Today’s blog post was authored by Margaret Weber. Margaret is PhD candidate for the Department of History at Iowa State University. Why go to the archives? This is a question that has been asked of me a lot, especially by my students. I have often witnessed many Iowa State students pass the Special Collections & University Archives (SCUA) on the fourth floor of the library. A few brave souls venture in. Some spare a quick glance at the glass exhibit case and closed door. Most though pass by without another thought. What exactly is behind that closed door? And perhaps more importantly, what can the Iowa State archives offer to its students, faculty, staff, and the public at large? The answer…a place to satisfy your curiosity. For behind that closed door is a gateway to documents and artifacts that magnify our past and help us understand the present. In a world of digitization and computer screens, what value is there in a stuffy place where old documents exist? Can’t the answer just be found online? Despite many advancements in digital collections in the past several years, those online documents pale in comparison to the type and variation offered at Special Collections across the country, including Iowa State’s. Lots of one of a kind videos, books, pictures, scrapbooks, artifacts, and other archival material can only be found here. There is something special about holding a document in your hands, seeing the text itself. It is a chance to truly get a feel for the quantities of our collective past. To use those documents to create a narrative of your own. Nowhere else on campus offers such an in-depth look into the university’s history and life. Want to find out what university life was like in the roaring 1920s? Go to the archives to look at dance cards and homecoming pictures. Was there student unrest in the 1960s? Find the answer in the archives by reading through the Daily’s opinion section. Want to locate your grandfather’s or grandmother’s master thesis? It’s here in the archives, along with all of the other theses and dissertations. From the Manhattan Project to Morrill Act, there is lots explore on the fourth floor. But it is not just Iowa State history documented here. The library’s archives also hold vast collections on technological and scientific advancements, developments in agriculture, political history, and much more. In my own personal research on agriculture in the postwar period, the various non-ISU manuscript collections have proven to be invaluable. Very few other archives cover such a wide range of rural life and the development of America’s food system. All archives, including Iowa State’s, play an important role in preserving pieces of our history. And finally, while the university is a place to ask questions, its archives represents an opportunity to formulate your own answers. One of the greatest things about academic life is the expansion of the mind, the ability to ask questions, and find possible solutions. Curiosity is the fuel on the fire of learning. And the archives, like its classrooms, computer labs, and scientific laboratories, are just another resource for students to use to satisfy that inquisitiveness.